Warning: This web page is deprecated. Current homepage is this. 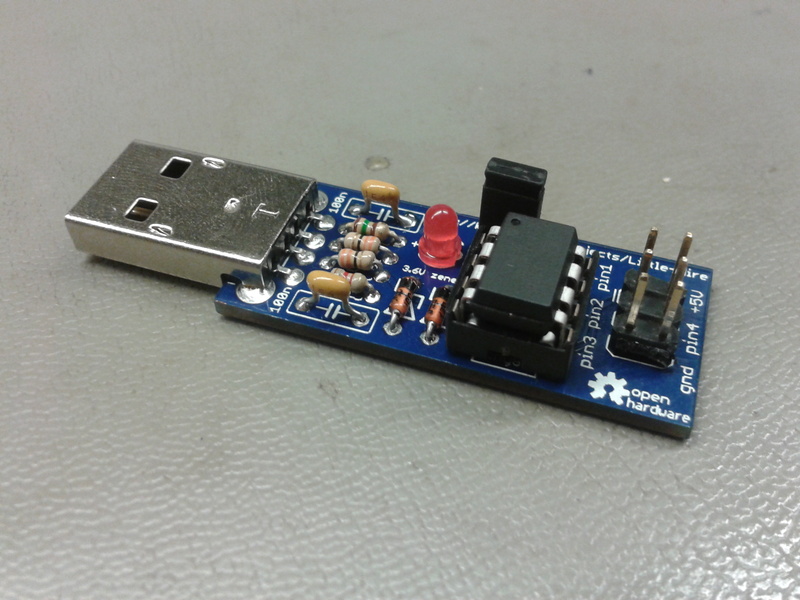 - When i saw simpleavr's implementation of usbtiny on attiny45 , i thought it would be cool if i make a kit version of this with a minimal form factor. Then i designed a PCB and sent for first prototype. Later on i thought, if i want to sell this, it would be much cooler ,and more suitable with "Open Source Hardware" concept, if i bring this project one step ahead. So i tried to fit anything extra to the device and this project came out. V1.1 beta firmware released for the Little Wire. You can find the changelog and details from this link. = Where can i buy one? - It is available at Seeedstudio right now! * Analog reading from pin3 pin isn't stable but supported. Use it at your own risk. - Eagle schematic / layout files. Also in PDF format.